To add a project to Reel-Scout™ version 10, Begin by entering the Projects module from the menu bar. Click on Add in the Projects sub-menu. *Except when you are typing in the Project Summary and Location Needs fields, avoid using the “enter” key. Using the “enter” key will save the project file as is and move you to the next page. If you inadvertently strike the “enter” key, you can search for your project and then continue to edit your work. On the Add Project screen, you can enter all of the information for your project. Required fields are those that are marked with a red star (*). The Project Name field is a free-form text field and is required to save the project in the database. The name is not required to be unique. For projects of the same name, the differentiator will be the project ID number which is automatically assigned by RS10 when the project is saved. In other words, the library will store two projects with the same name. The differentiator will be the project id# which is a unique identifier automatically assigned by Reel-Scout™ for each project record. A checkbox to the right of the Project Name allows you to make the project confidential. Confidential projects will not be viewed publically. *Although the application does not limit the character length of the project name, it is best to keep the project name to 40 characters or fewer. Status is a required field. Valid project statuses are listed. If additional selections are needed, inform your system administrator. The Source, Type, and Staff fields are required inputs for a project to be saved in RS10. These are single-select, drop-down menus that allow you to record the source of the project, the type of project, and the film office staff member that is responsible. The Group box is a drop-down menu configured explicitly for your film office. The Groups field allows you to assign as many groups as you wish. As an alternative to scrolling to find a particular group, you can begin typing the name of the group and RS10 will type-match your entries and display options that match your inputs. If a group needs to be removed from the field, click the “X” next to the group name. The Project Summary and Location Needs fields are free-form text fields that allow you to describe the project and the client’s needs. You are limited to 4000 characters in these fields. The Main Production Company is an interactive “screen within a screen” that has four tabs that capture all of the information you will need. 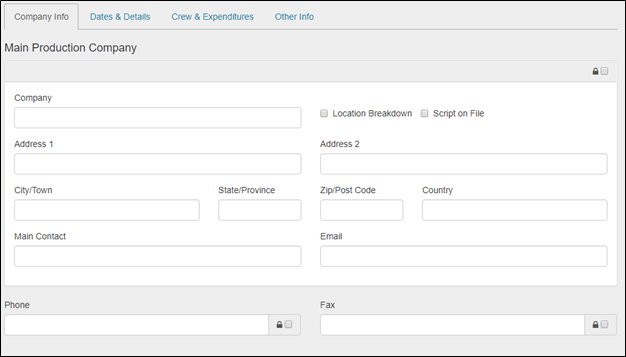 There are tabs for Company Info, Dates and Details, Crew & Expenditures, and Other Info. When the lock icon in the upper right-hand corner of the Main Production Company block is checked, the information entered will be kept confidential. Additionally, separate lock icons are provided for the phone and fax numbers. For more information about completing these blocks, see the Entering Project Details sub-section. If a local production company is used on the project, their contact information can be entered in the free-text boxes here. Buttons are provided to indicate if the company is locally based. The default setting for the Locally Based Company attribute is “No.” When the lock icon in the upper right-hand corner of the Local Production Company block is checked, the information entered will be kept confidential. Additionally, separate lock icons are provided for the phone and fax numbers. When you have completed adding your project information, click the Save button.